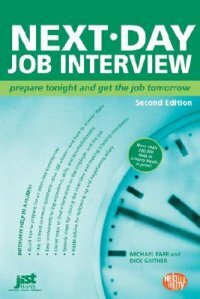 Quick and essential tips for tomorrow's interview -- Knowing yourself and what you can do -- Researching the industry, company, job, and interviewer -- Answering key interview questions -- Handling tough interview questions and unusual situations -- How to close the interview and leave a lasting impression -- Following up after the interview -- Negotiating your salery -- Appendix: Online interview resources. Provides quick tips to help you prepare for an interview, research the employer, make a lasting impression, and follow up. Help in a hurry series. Indianapolis, IN : JIST Works, c2009. Description: xiv, 178 p. : ill. ; 23 cm.